Are you interested in learning how to arm-knit or finger-knit blanket that is so super-chunky and super-cozy that will fill up your home with a really warm hygge feeling? This ultimate DIY project doesn’t require any special skills and may take as little as 40 minutes! You don’t even need any tools (aka knitting needles or crochet hooks) for this simple DIY craft. Arm-knitting and finger knitting are becoming extremely popular crafts with new lines of finger knit blanket yarn. Finally, some chunky knit blanket yarn now comes even with pre-made loops! If you are starting on a finger-knit blanket, you must decide on the size first. As you would see from our collection of best super-chunky blankets, they come in different sizes. 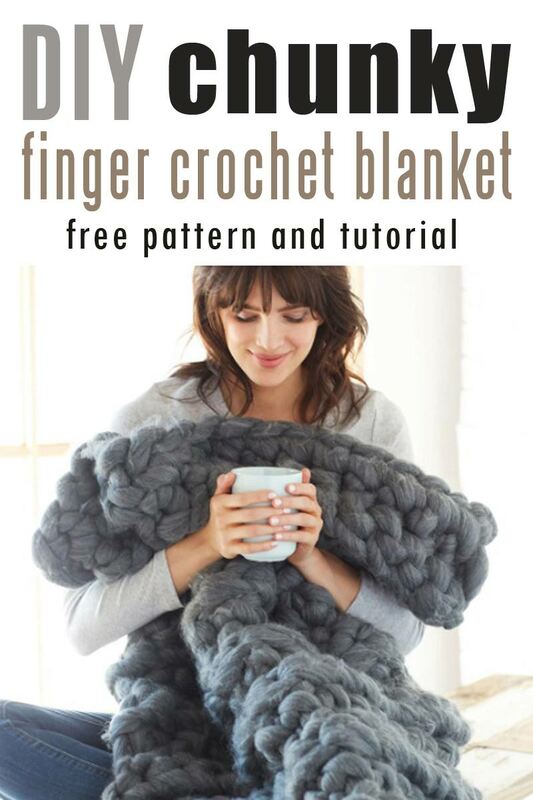 What is the best size for a DIY super-chunky finger knit blanket? a large blanket is as big as 50″ x 60″. Though keep in mind that a bigger blanket will require more giant yarn for arm knitting. If you are a knitting or crochet aficionado and already have big needles or super-sized crochet hooks, there are projects you can easily craft in one evening so you can give that chunky knit yarn a try. How can you create a DIY super-chunky blanket? you can take advantage of new lines of chunky knit blanket yarn with pre-made loops – super easy! you can use big size 50 (25 mm) circular knitting needles. 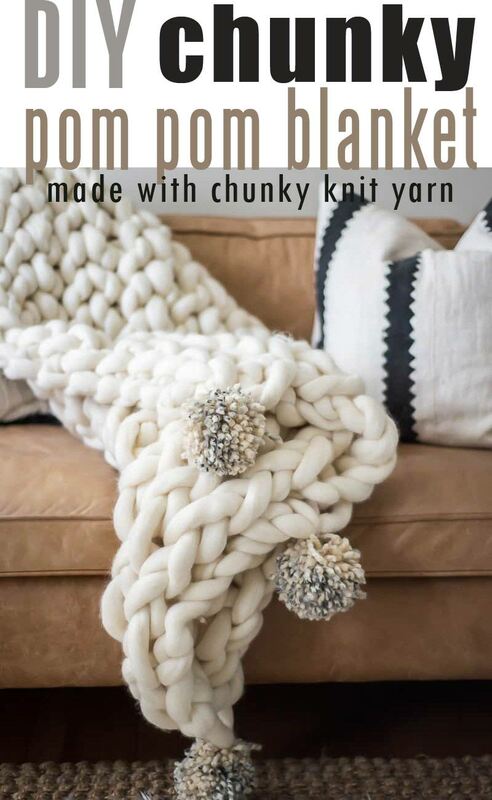 So, browse through our collection of 10 best chunky knit blankets on the web to decide on your next DIY home decor project that will make your house feel so warm and cozy. 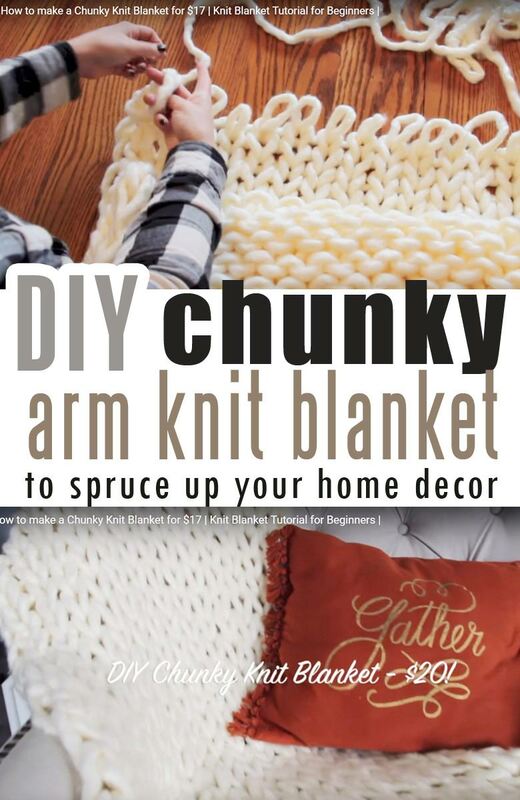 Are you looking for a thrifty arm knit blanket project? This very detailed video tutorial shows how to create this trendy DIY chunky blanket on your dining table, without any tools. If you already shopped for chunky yarn for arm knitting, you have probably noticed that it can be pretty pricey, especially super chunky merino arm knitting wool. If you are a beginner and just want to give this trendy craft a quick try, there is no reason to spend a fortune on your first project. You can buy chunky knit yarn at Michaels using their 50% off (or 40% or 60%) coupon and create a chunky knit blanket for under $20! This excellent video by Kristen At Home teaches you how to do it in less than an hour! Pretty amazing! White and off-white colors will go perfectly with modern farmhouse decor. Love this video below by Peony and Thyme on how to make this extreme-knit gorgeous chunky blanket with real merino wool. Note to crafters: don’t forget to remove all rings and jewelry before starting your arm knitting as it is easy to snag this chunky goodness. Where to buy arm knit blanket yarn? If you are wondering where to buy real chunky merino wool yarn that was used in this video, this handy kit from mamaknowsdesign.com gives you everything you need to create a small throw – and a choice of 70+ colors. Though it is not cheap, this luxurious extreme hand-knitted blanket is pure luxury. Worth trying if you are looking for something special to make your home extra cozy for cold months. How much yarn would you need for an arm-knit or finger-knit blanket or throw? 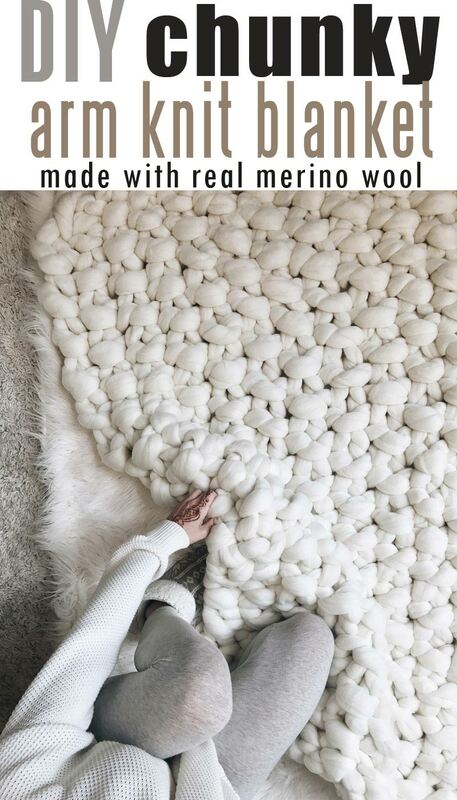 You definitely want to use every inch and millimeter of this luxurious giant chunky wool yarn to make your blanket as big as possible and not to have any leftovers. The Nantucket Throw is one of the original Loopy Mango products and is one of the most popular chunky knit blankets on Pinterest. This DIY kit comes with one skein of Loopy Mango Big Loop Yarn, 40 oz (1134 g), approx. 125 yards (115m) – of pure 100% Merino Wool goodness – and Size 100 (35mm) Circular 40” (100 cm) Birch Wood Knitting Needles. The FREE pattern for this DIY chunky knit blanket is available for download on the website under free patterns (it is listed for ‘beginners’ and indicates that you can complete this easy DIY project in just a couple of hours). If you’re looking for a gorgeous chunky knit blanket tutorial, check out this awesome video by Broadwick Fibers that explains every detail of flat-knitting technique. It’s truly the easiest way to make a super-chunky giant knit blanket! You’ll also learn what is the best type of merino knitting wool to use for your blanket and some felting techniques. All you would need for your project is super chunky merino wool yarn, flat surface, and your hands. So cool! This lap blanket by Michaels is made using a total of 2 skeins of Loops & Threads Free Spirit Yarn in Charcoal. Instead of using a hook, you will single crochet with your hands and fingers. Free pattern instructions are available on the website and you can even order your yarn online (and pick it at the store, thus avoiding shipping charges). Finished measurements are 40″ x 28″. It is an easy DIY yarn project that can be accomplished in an hour. Awesome! Would you believe you can make this gorgeous Arm Knit Blanket in just 1 hour?!!! Watch the easy-to-follow video tutorial on the website and read the instructions to be ready to knit your own super-chunky trendy blanket. Most importantly, it makes your arm knit blanket project super-easy with free pattern and suggestions on where to buy chunky yarn used in the video. Pom poms give it more character and are so fun and easy to make! Loe it! In this tutorial by Simply Maggie, you’ll learn how to make a blanket measuring 55″ by 36″ using 9 skeins of one of the favorite yarns of arm knitters everywhere, Couture Jazz by Premier Yarns. It is a soft and fluffy knitted tube of fine, brushed acrylic that can be used to make a blanket in under an hour or a trendy cowl in 15 minutes! Even more, it is chunky enough for an arm-knitted blanket and had great customer reviews, last time we checked. Watch this video tutorial for very clear and easy-to-follow instructions! Not convinced which arm knitting project is for you? You may check this 45-minute arm-knit blanket tutorial – another giant arm knit masterpiece. Noteworthy, this yarn features unique preformed loops so without any needles or hooks, blankets (and other chunky-knitted projects, such as cowls, hats, etc) can be completed faster. Therefore, all your DIY yarn projects will be easier to complete with finger knitting rather than using traditional knitting techniques. Watch this video tutorial to decide if this technique is for you and grab some yarn to try it out at your local craft store or online. Likewise, you can even do panels for a trendy gingham blanket and easily join them without sewing. There are a few blanket patterns with this soft chenille yarn on Yarnspirations, to get you inspired – like this Textured Blanket. Therefore, this yarn may be a first step in teaching your kids to knit – even 4-year old will have no problem trying it out. Most importantly, this is a great step-by-step tutorial that is so detailed that it doesn’t require any text for you to learn this arm knit blanket technique. 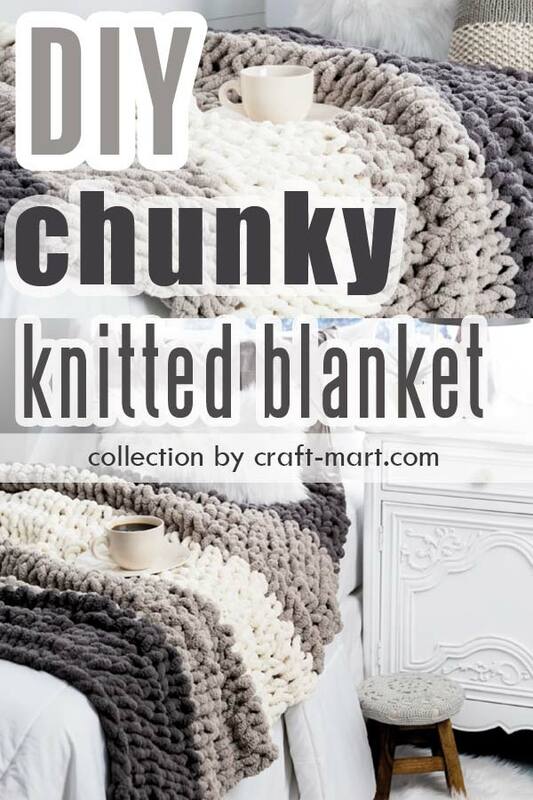 The chunky blanket – a top favorite of many crafters and designers – was created using Gentle Giant yarn. You’ll be pleasantly surprised how quick and easy this DIY chunky arm knit blanket project really is. This cozy Under Cover project by Hobby Lobby looks as inviting as it feels! If heaven for you means soft yarn, a cup of coffee, and a snow day (when staying home is an excuse to knit), then grab this soft chenille-style bulky yarn to create a hygge-style soft blanket. While giving you a pure luxury feel, this is an easy DIY chunky knit blanket for your modern farmhouse decor. Hope you enjoyed our collection of trendy super-chunky blankets tutorials and got inspired to try it out yourself. A simple DIY arm-knit blanket is a quick and easy way to add cozy handmade decor to your home.